It’s a totally awesome action figure of Haytham Kenway from the hit Assassin’s Creed III video game! 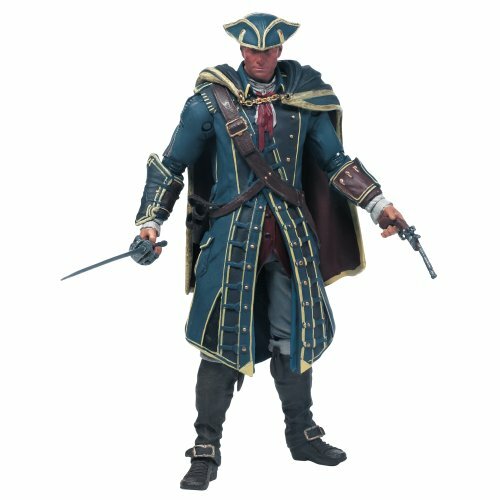 This Assassin’s Creed III Haytham Kenway Action Figure features the British noble in his standard attire, with long jacket and tri-cornered hat. With a total of 25 points of articulation, this awesome action figure even comes with a pistol, sword, and code to unlock exclusive Assassin’s Creed video game content! In Assassin’s Creed III, gamers were first introduced to Colonial America not by Connor, but by an unexpected character, Haytham Kenway. Originally from England, this master Assassin is dispatched to the New World to secure an important First Civilization storehouse – a site believed to hold the immensely powerful, ancient artifacts that are central to the conflict between the Assassins and the Templars. His journeys lead him to a Native American woman, Kanieht? :io, with whom he fathers a child – Ratohnhak? :ton.